San Diego Gas Electric (SDGE) has taken the wraps off a new battery energy storage project that will store up to 2 megawatts of electricity -- enough to power 1,000 homes for four hours. 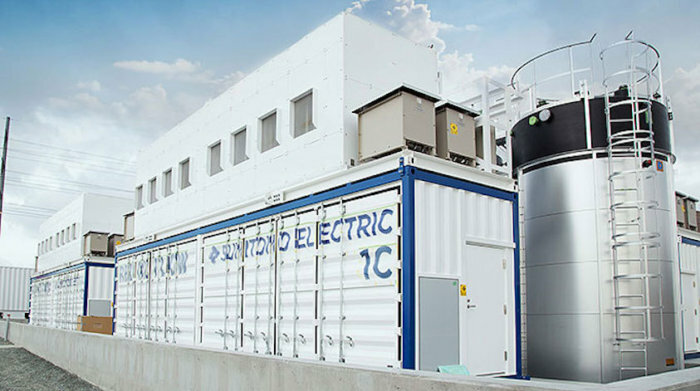 The new vanadium redox flow (VRF) battery substation was installed by Osaka, Japan-based Sumitomo Electric and will store renewable energy harnessed from solar panels and release it when resources are in high demand during peak business hours. "We are delighted to see our first flow battery system operating in the U.S. through the multiple-use operation of the battery system in SDGE's distribution network; we would like to prove its economic value and potential use on the electric grids," Junji Itoh, managing director of Sumitomo Electric, said in a statement. An interior view of the new vanadium redox flow battery installed by SDGE. The SDGE project is part of a trend involving utilities that deploy battery storage substations to supplement grid power supply during peak hours rather than drawing more electricity from generating sources such as coal-fired power plants. The California Public Utilities Commission (CPUC) ordered SCE, PGE and San SDGE to solicit more utility-scale energy storage. CPUC is requiring utilities to meet a target of 1,325MW (1.3GW) of additional power storage by 2020. In January, for example, Southern California Edison (SCE) flipped the switch on what was the largest lithium-ion (Li-ion) battery storage facility in the world -- a substation with 80 megawatt hours (MWh) of capacity. Flow battery systems have an expected life-span of more than 20 years, and could have less degradation over time from repeated charging cycles than other technologies, SDGE said. Unlike the fastest growing battery technology -- Li-ion -- vanadium redox flow batteries are a type of rechargeable battery that employ vanadium ions in different oxidation states to store chemical potential energy. Flow batteries and Li-ion batteries work well with intermittent energy sources such as solar panels and wind turbines because of their ability to be idle for long periods without losing a charge. 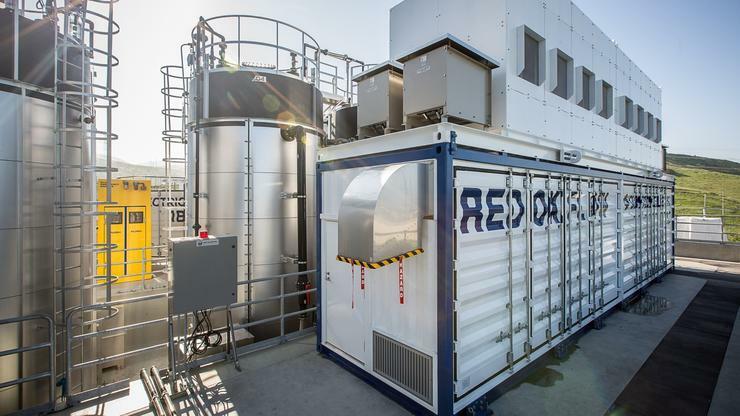 Flow batteries, however, scale more easily because all that's needed to grow capacity is more liquid; the hardware remains the same, according to Dean Frankel, an associate at Lux Research. That means flow batteries have the potential to be less expensive than Li-ion. They also last longer, according to Frankel. At full discharge, Li-ion batteries last only four hours. To double that charge time, another complete battery unit must be added, Frankel said. One problem with flow batteries for residential use is that they're enormous. In order to power a house, you'd need a flow battery about half the size of your garage, Frankel said. Li-ion batteries, like Tesla's, can hang on a garage wall. But for utility or corporate use, a flow battery's size wouldn't matter, and they scale in capacity by just adding more tanks of electrolyte liquid. Li-ion batteries require an entirely separate unit to be daisy-chained in. 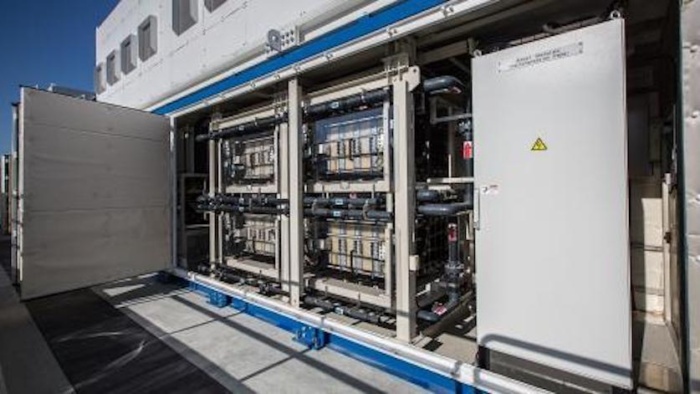 Flow batteries will almost always be more expensive than Li-ion systems on an installation basis, but on a per-kilowatt-hour basis (i.e., how long they can run, depending on how large the electrolyte fluid tanks are) they can be cheaper, according to Lux Research. The larger the tanks, the more power you can get. Without the adoption of energy storage, and specifically utility-scale power systems, the U.S. power electric grid could eventually fail, according to a study by Navigant Research. Research from Bloomberg New Energy Finance (BNEF) forecasts massive growth in the energy storage market, first by utilities and then by corporations seeking to reduce overhead costs. The Global Energy Storage Forecast, 2016-2024 report shows that the annual investment in energy storage systems will increase six-fold to $8.2 billion in 2024. The top five markets for energy storage are Japan, India, the United States, China, and Europe; they will represent 71% of the global total for storage installed in 2024, according to BNEF. Li-ion batteries are best positioned to meet the demand for energy storage over the next five to 10 years. But in the long run, other battery storage technologies will be needed for long-term energy storage and larger-scale applications. In fact, the inventor of Li-ion batteries recently unveiled what he called a better all-solid-state battery that could lead to safer, faster-charging, longer-lasting batteries for handheld mobile devices, electric cars and stationary energy storage. John Goodenough, 94, a professor at The University of Texas at Austin and co-inventor of the lithium-ion battery, has invented a new technology that could lead to safer, faster-charging, longer-lasting batteries. 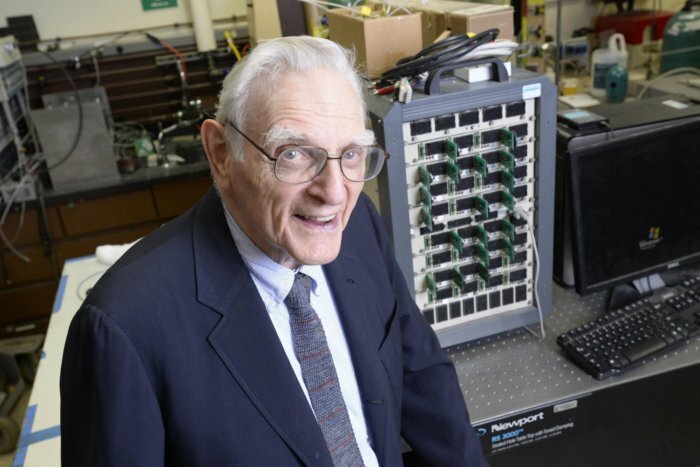 Nobel Laureate John Goodenough, 94, and his research colleagues at the University of Texas at Austin demonstrated that their new battery cells have at least three times as much energy density as lithium-ion batteries. "Today's lithium-ion batteries use liquid electrolytes to transport the lithium ions between the anode (the negative side of the battery) and the cathode (the positive side of the battery). If a battery cell is charged too quickly, it can cause dendrites or 'metal whiskers' to form and cross through the liquid electrolytes, causing a short circuit that can lead to explosions and fires," the researchers said in a statement. Instead of liquid electrolytes, the researchers' new battery technology relies on glass electrolytes that enable the use of an alkali-metal anode without the formation of dendrites. The use of Li-ion batteries continues to grow quickly because prices have dropped due to economies of scale. Tesla and its development partner Panasonic are leaders in lithium-ion battery production. By 2020, Tesla CEO Elon Musk believes his company's "Gigafactory" outside Reno, Nev. will produce 35 gigawatts (a gigawatt is one billion watts) of battery capacity, with the objective of driving down the per-kilowatt hour (kWh) cost of battery packs by more than 30%. Tesla offers residential and commercial Li-ion battery systems. Over the next decade, Li-ion batteries are on track to become the mainstream energy-storage technology, with more than 80% of global energy storage installations using it by 2025, according to research firm IHS. Half of all energy storage installations will occur behind the meter, driven by self-consumption and back-up needs.